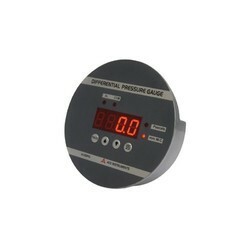 Digital Pressure Gauge is a part replacement for Analog Type Magnahelic Gauges. The digital differential pressure gauge finds immense use in measuring the differential pressure across 2 clean rooms or HVAC applications including Laminar Air Flow Cabinets, Biosafety Cabinets, Pass Box, Fan Filter Units etc. It is available in a smart M.S. Powder Coated Cabinet with a Stainless Steel Front Flush Plate for mounting into Modular Clean Room Walls & Brick Walls. The Digital Differential Pressure Gauge is a high accuracy Gauge with an easy to read digital 7 Segment, 4 Digit Red LED Display. Accuracy of the instrument is unmatched at /-0.5% F.S. Options include 4-20mA Re-transmission output & also an isolated RS 485 Modbus Communication for connecting to BMS & SCADA Applications. Power Supply options include an industry standard 24 V.D.C. Input Supply & also a direct 230 V.A.C. Supply Model. Additional models in the Digital Differential Pressure Gauge also include 1 or 2 relay outputs in IP 65 ABS Plastic Enclosures for varied applications. 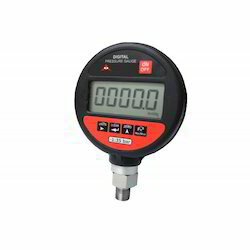 Digital Pressure Gauges are imported gauges with LCD display powered by battery for precision pressure measurement & display. Available in all ranges from -1 to 5, 10, 16, 20, 25, 40, upto 700 Bar. Units are selectable from front key pad between Bar, PSI, Kg/cm2. Accuracy of /-0.25% & supplied with calibration certificate traceable to National Standards. Differential Pressure Indicators are Digital Readout Magnehelic® Gauges Suited For Application In Laminar Air Flow Cabinets, Clean Rooms, Biosafety Cabinets, AHU, Etc. Differential Pressure Indicators Are Part Replacement For The Analog Magnehelic® Gauges & Are Easy To Use With Clear 4 Digit Led Display. It Comes With Built In Sensor & Also A Buzzer Alarm With Acknowledgement Facility For Process Violation Alert. Salient Features Include Unit Conversion At The Press Of A Key Between mm.W.C. & Pascals, Integrated Buzzer Alarm For Set Point Violation, Offset Provision To Meet Audit Requirements, Analog 4-20ma Output, 30 mm. Depth For Clean Room Modular Wall Fitment & RS 485 Modbus Communication For BMS / SCADA / PLC Integration. 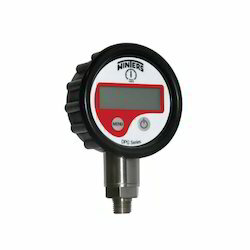 WINTERS make Digital Pressure Gauge available for all pressure ranges from 0 to 10000 psi OR -1 to +700 Bar. Simple 2 button operation, front key selectable engineering units , Re-zero feature and continuous pressure reading, Backlight turns on when on/off button is pressed and with pressure changes. Pressure Meter is very handy, small and easy to use. Pressure Meter measures the absolute pressure with an accuracy of +/-3 hPa and is ideal for absolute pressure compensation in flow measurements. 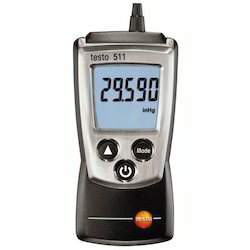 Pressure Meter is converted to barometric air pressure by entering the on-site altitude above sea level. We can also use the measuring instrument to measure barometric altitude between two points. 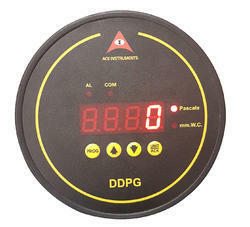 Digital Differential Pressure Gauge is a part replacement for Analog Type Magnehelic Gauges. The digital differential pressure gauge finds immense use in measuring the differential pressure across 2 clean rooms or corridor & HVAC applications including Laminar Air Flow Cabinets, Biosafety Cabinets, Pass Box, Fan Filter Units, etc. It is available in a smart M.S. Powder Coated Cabinet with a Stainless Steel Front Flush Plate for mounting into Modular Clean Room Walls & Brick Walls. The Digital Differential Pressure Gauge is a high accuracy Gauge with an easy to read digital 7 Segment , 4 Digit Red LED Display. Accuracy of the instrument is unmatched at +/-0.5% F.S. Options include 4-20mA Analog Output Re-transmission & also an isolated RS 485 Modbus Communication for connecting to BMS & SCADA Applications. Power Supply options include an industry standard 24 V.D.C. Input Supply & also a direct 230 V.A.C. supply model. Integrated Buzzer Alarm for Process Violation Alert is a standard feature . Additional models in the Digital Differential Pressure Gauge also include 1 or 2 relay outputs in IP 65 ABS Plastic Enclosures for varied applications. Looking for Digital Pressure Gauge ?